Grab hold of this firm, comfortable grip for easy vertical shooting. More creative freedom and expanded power supply options make this the perfect companion to your DSLR-A700 camera. 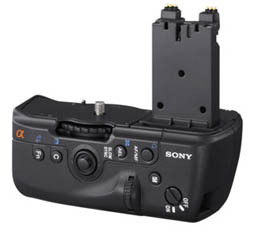 Simply connect this vertical grip to your Sony® α(alpha) DSLR-A700 camera and experience its ergonomic design and ease of use for more stable vertical shooting. Rugged yet lightweight dust and moisture resistant magnesium-alloy construction. Adding a second battery doubles the camera Stamina to approximately 1,300 shots. Please Note: Vertical Grip for DSLRA700™ (alpha) Digital SLR Camera.